"What does the Town of Longmeadow do for preventative maintenance on sewers and water mains?" I asked a former member of the Water and Sewer Commission back in 2003, during a Charter Commission meeting. The town was investigating whether the structure of government was helpful in meeting town needs or was causing problems. The answer we received, that there was no preventative maintenance, surprised me. Who would think that this gem of towns in western Massachusetts had a flaw so deep inside? That was one problem. There were several others. The town ultimately voted to restructure government so that it would more easily attend to residents' needs. It is not perfect; indeed, there may be no such thing as an ideal fix. But we can see evidence of improvement in maintenance of town resources, especially in the process used for the proposal to solve the problem that is our high school. In particular, residents need to know about "The Maintenance Factor" as Director of Public Works & School Building Committee member Michael Wrabel puts it. What does he write of the existing HS building? "Mechanical, electrical and plumbing systems (MEP) and Heating, ventilation and air conditioning systems (HVAC) are showing their age. Components have been out of service and have adverse affects on the building and the everyday users of the high school. Steam lines that are in mechanical chases or tunnels under the building are degrading and leaking. Access for repair is difficult and often requires asbestos abatement work prior to the mechanical repair being completed. In 2009 a broken steam line that crosses a courtyard from one addition to another ruptured and required partial replacement. Access to the courtyards for excavation is non-existent for excavation equipment and repairs were expensive to perform. Plumbing drain lines that were installed in the 1950’s become blocked and at times requires breaking of a concrete floor for access to permit repairs. Air handlers, blowers, heating and cooling coils, all parts of the HVAC system constantly require service because of their age in spite of routine preventive maintenance that is performed on them." "Replacement of this tired and out-dated facility with a modern structure will enhance the ability of custodial and maintenance staff to perform routine duties. Building energy efficiency will be increased and capital project spending will be decreased for the next 10-15 years if this project receives approval from the residents. As someone (on the Housing Authority) who is keenly aware of residents' housing needs (and is working to improve the situation for those who are struggling financially), and as someone who has been aware of the ENTIRE TOWN's infrastructure needs for several years, I am in favor of the High School proposal. It will contribute to a much better Longmeadow, one that benefits all residents. Unfortunately, the necessary corrections to Jim Moran’s latest post were too extensive to put them all in comments to his post. Jim’s effort to question the relevance of my statement regarding the fact that the high school project is a capital budget expense and the library operation is an operating budget expense is wrong headed. Apparently, Jim was fooled by Mr. Wojcik’s rhetorical sleight of hand. Mr. Wojcik conflated the principle and interest payments (which do happen annually) with operating expenses like library operations as if the cost of one would be necessarily pitted against the cost of the other. The fact that there is absolutely no credible evidence to suggest this scenario, and that it is based on cherry picked assumptions, clearly complicates Mr. Wojcik’s efforts to frighten library patrons into cutting off their noses to spite their faces. This is particularly disappointing commentary given Jim’s dedication to keeping up with issues in our town. His work in this regard is tremendously valuable. But this analysis is way off the mark. No one has ignored or discredited mentions of other capital needs in town, in fact during the exhaustive process of working toward the new high school virtually every elected official in town solicited opinions about the town’s priorities. Indeed, the elected officials who support the high school project are also the officials most acutely aware of our budgetary and capital needs issues. The arguments of Messrs Wojcik and Nolet have been heard and debated ad nauseum. Their credibility at this stage requires the belief that our elected officials are either incompetent, corrupt, or both, and that is simply beyond the pale. The idea that supporters have simply rammed through the high school project without regard for the opinions of those who have different priorities is cynical and wrong. Essentially, Mr. Wojcik and company simply lost the priorities debate on the merits, something made blatantly obvious by the desperate nature of their “argument” against it now. Wojcik tried to argue that we can’t afford a new High School as if we haven’t spend the last year carefully weighing the manner in which we were going to upgrade a high school that presently violates any number of building code requirements and has failed to keep up with the requirements of properly educating our children. He also seems oblivious to the fact that the present project is a hell of a good deal that will never get cheaper. He wants folks to believe that all the other town needs will fall by the weigh side if we build a new high school and yet he has never even presented an alternate vision of the town’s priorities placing something else in front of the high school. Wojcik and company argued that we could renovate for less. They were proven wrong on that. They cherry picked a claim from an old study that seemed to imply the feasibility of cheaper renovation, ignoring the finding of that same study which strongly recommended building new. At every step of the way these “concerned citizens” had their concerns proven unwarranted and now they are simply throwing every possible argument against the wall and praying that something sticks. So what was left of Wojcik’s arguments last night? He put some old wine in slightly new bottles, primed the audience's economic anxiety and fear of the unknown, and then tried to slip in his “Hail Mary” pass – that our Select Board and School committees want to commit all of our resources to the schools and close the Storrs library. For Wojcik, its really all about stopping our elected officials from building a Taj mahal for their kids on the backs of Longmeadow’s hard working folks without kids in the school. Incidentally, both pro and anti school factions in our town have parents and empty nesters aplenty. Short sightedness is not an age-related disability. The effort to construct an "us versus them" narrative along generational lines is just a cynical ploy intended to maximize emotional reactions. Jim Moran is one of our town’s most valuable civic assets and I have tremendous respect for what he does and usually how he does it, but I think he might have gotten too close to some folks on this one and lost his perspective. He thinks that high school supporters like me “do not want to discuss the financial ability of Longmeadow’s town residents to support such a project.” We’ve been discussing that very thing all along. If we use Mr. Wojcik's budgetary assumptions we'd have to conclude that our town can never afford to do anything, which of course is the conclusion his chosen assumptions were designed to encourage. The fact is that the people who understand that schools are our town’s most valuable asset are the majority of the folks who do all the work and show up to all the meetings and sacrifice massive amounts of their time to run for and serve on town government boards and committees. The proud few like Wojcik, who are very active in town but do not share this view of our priorities are understandably frustrated about their inability to win arguments in our participatory political process, but that’s no excuse for dishonesty and fear mongering. Their efforts to incite the anger of voters who are not engaged in, or knowledgeable about the town's affairs is shameful. Frankly, I cannot understand how anyone can put much stock in Mr. Wojcik’s “budgetary analysis,” which several audience members clearly debunked during the meeting last night, given his shameful efforts to exploit the fears of residents and to smear the good names of public officials that have given him every opportunity to make his case and who have earned the respect and admiration of all of our town’s residents. I think residents of good will should demand the immediate resignation of Mr. Wojcik from the town’s Finance Committee. His distorted budgetary analysis makes him unqualified for that job and his baseless attacks on the integrity of our elected officials makes him unfit for public office. 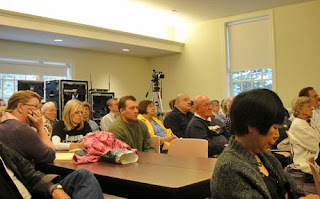 is the name of the group led by Roger Wojcik that organized a “public” forum that was attended by an overflow crowd of ~ 65-70 people last night at Storrs Library. The meeting objective as outlined at the outset by Mr. Wojcik was to provide some factual information about the financial issues facing the town both today and into the future. This group believes that many town residents need additional information to make informed decisions at the upcoming town meetings on May 11 and May 25 as well as town elections on June 8. Mr. Wojcik asked attendees to be respectful to each other and not have a repeat of the April 12 forum. First of all, I applaud Mr. Wojcik’s attempt to provide some factual information about town finances including both the town’s annual operating and capital budgets as well as some of the other current liabilities such as Other Post Employment Benefits (OPEB). In addition to being a member of the town’s Finance Committee and a past member of the Capital Planning Committee, Mr. Wojcik has useful workplace experience in developing and managing corporate budgets. During the meeting Mr. Wojcik was criticized a number of times by some attendees, particularly about the accuracy of a $35 million OPEB future liability but he pointed to an official town analysis by Scanlon & Associates as his source. Similar objections were voiced about a report on town infrastructure problems and there were attempts by some attendees to discredit this information as well. Other than one flamboyant outburst by a well-known town resident and regular poster on this blog, the meeting proceeded with a reasonable decorum- far better than the previous forum on April 12 (see my previous post)…. that is, until Mr. Wojcik turned the meeting from an information session into a political debate about Select Board candidates for the upcoming election and the inadvisability of electing former/ current School Committee members to the Select Board. What followed was not unexpected from my vantage point given the makeup of the audience.... the meeting turned into a similar “shouting match” situation as did the April 12 forum and the meeting ended on a very sour note…. I have listened and attended numerous Select Board/ School Committee meetings as well as official public forums on the current school/town budgets and high school building project during the past 9 months. I believe that I understand the situation quite well and have become very concerned about where we are headed. He also states that Mr. Wojcik would have “earned a poor grade in my public budgeting course”. During the meeting Mr. Duquette also restated his recurring theme that “you can’t run public government like a business”. Mr. Duquette’s approach is similar to many new HS school building advocates who have simply decided to ignore or discount or discredit mention of the any other financial needs of the town and want to simply move forward and build the new high school. They do not want to discuss the financial ability of Longmeadow’s town residents to support such a project. Our town leaders need to BALANCE available financial resources to deliver both school and town services so that all segments of our town population are treated fairly. With two seats (out of 5) on the Longmeadow Select Board being decided at the June 8 election, it is important for town voters to fully understand each candidate’s position on this issue so that they can make right choices. WARNING: The following was written while angry and despite being accurate, it flatly contradicts sound political advice dispensed by the author (i.e. me) in an earlier LongmeadowBuzz post. The author, and only the author, is responsible for the content and tone of this analysis. Tuesday night, I attended a “public forum” conducted by a group of Longmeadow residents calling themselves “Concerned Citizens of Longmeadow.” The purpose of this group is to oppose the construction of a new high school, a question that will be decided by the voters this spring. While there is an argument to be made about whether or not the high school is our highest and most urgent priority, these “concerned citizens,” represented by town elder Roger Wojcik, have decided not to make such an argument. 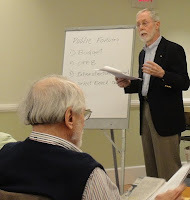 Apparently, unwilling to admit that his group considers our schools to be lower on the priority list of town services than such things as reserve funds and infrastructure repairs, Wojcik used his “public forum” to paint pessimistic pictures of the town’s budget and the funding of future employee benefits obligations, both based on dubious interpretations of available data. While these arguments were weak, at least they were debatable. As the meeting progressed, however, it became clear that the primer on public finance (which sadly would have earned Mr. Wojcik a poor grade in my public budgeting course) was mere prelude to the group’s real purpose, which was to generate opposition to the new high school project by convincing voters that it is much too expensive and, more importantly, that it’s also a pet project of town elected officials engaged in a conspiracy to improve the schools at the expense of other town services. There are two reasons why this scare tactic via personal attack is silly. First, the Select Board member so accused is a university professor. The annual convention of university professors willing to close public libraries could be held under a tent made from a single pair of Rush Limbaugh’s pants. Second, the library is an operating expense, while the new high school is a capital expense. Closing the library doesn’t do anything to advance the high school project. Essentially, Wojcik wants voters to believe that these evil former School Committee members on the Select Board have skillfully duped voters into electing them so they can siphon funds from non-school town services and build an unnecessarily expensive new high school... and a couple of them may have been born in Kenya. (Sorry, I couldn’t resist) At the very same time, inexplicably, he also expects us to believe that these folks are dumb enough to seriously advocate closing the Storrs Library. What these “concerned citizens” apparently hoped was that fearful library patrons (apparently without a penchant for logic or common sense) would be inclined to oppose the new high school just to spoil those anti-library former school committee members’dastardly plans. I’m telling you, this guy was starting to make Glenn Beck look clever by comparison. He tried to put forth a sort of principled objection, though not to the new high school. Instead, he tried to bolster his School Committee takeover of the town conspiracy theory with a plea for voters to apply a form of “checks and balances” in the voting booth this spring by rejecting the Select Board candidacy of present School Committee women Christine Swanson. In addition to further reducing his intellectual credibility by badly misconstruing the notion of "checks and balances" in his efforts to justify a baseless smear of a highly capable member of our town's elected leadership, Wojcik managed to put the last nail in the coffin of his integrity as well, thanks to an audience member who served with Wojcik on the town’s last Charter Commission who essentially hoisted him on his own petard by recalling for the audience that Mr. Wojcik had explicitly endorsed the usefulness of joint membership on the Select Board and the School Committee during the recent Charter Review process, and asking point blank why he has reversed himself on that point. His failure to offer an audible response was deafening. Bottom-line: These “concerned citizens,” having exhausted their legitimate, though relatively weak, arguments against the new high school, took a page right out of the Karl Rove playbook and are mounting a distract and confuse campaign featuring personal attacks on the integrity of the elected officials who are supporting the new high school project. The fact that the project resulted from a very comprehensive, transparent, and deliberative decision making process is something these “concerned citizens” must downplay as much as possible if they are going to have any chance of getting voters to oppose the project. The hope of such tactics is to generate fear and loathing enough to trick low information voters and provide a handy rationalization for a vote against the high school project by their fellow flat earthers and anti-tax zealots. Personally, I like to refer to these perennial opponents of the schools as the “I appreciate the value of education as much as anyone, but…” crowd. My advice to voters; ignore the soap opera, conspiracy theories, and the competition for who can be most offended, and ask yourself if schools are an important enough priority for our town to invest in a new high school right now. If, like me, you believe that high quality public schools are an irreplaceable component of a high value town, and that opportunities to undertake such improvements don't come along very often or with as much state funding assistance as this project has attracted, then a vote for the new high school is something to strongly consider. This morning’s Sunday Republican newspaper (4/24/10) contained an article entitled “Group Opposes School Building” – click here to read complete story on MassLive. 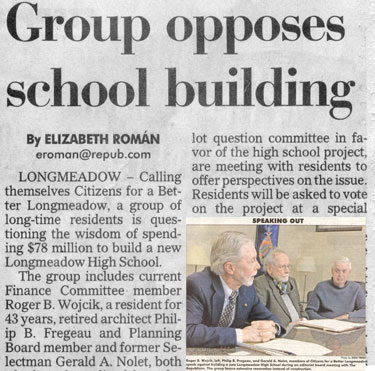 The group calling themselves “Citizens for a Better Longmeadow” voiced their concern to the Springfield Republican editorial board about the wisdom of spending $78 million building a new high school given the significant financial difficulties that are ahead for the town of Longmeadow. They believe a more “fiscally responsible” and lower cost renovation project would be in the best interest of the town. This group- led by Roger Wojcik, Philip Fregeau and Gerald Nolet have been holding “public forums” to express their concerns. Their next forum is scheduled for Tuesday, April 27 at 6:30 PM at the Storrs Library/ The Betty Low Room. Hopefully, the discussion will be more reflective of our town’s character and not resemble the last public forum on April 12 about which I wrote a Buzz posting that was largely a shouting match between the opposing sides in this debate.